In 1927, a mission church and rectory of St. George Church in Guilford was constructed and established on Thimble Island Road in Branford. In 1947, St. Therese Parish was established by Bishop Henry O’Brien, and Fr. Francis Breen was named founding Pastor. By 1966, O’Brien had become Archbishop of Hartford and authorized the building of a new church. There were over 500 families at that time. This church, located on Thimble Island Road, would later be sold to the Town of Branford when in 1968 a new church, located on Leetes Island Road, was dedicated by Bishop John Hackett. The new church sanctuary, bell tower, and altar are all made of “Stony Creek” granite. 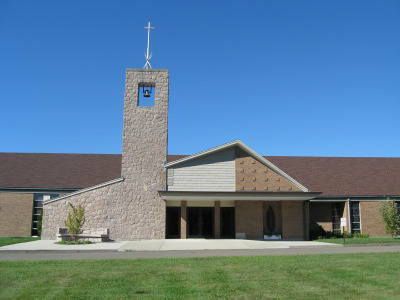 In 1997, a new Parish Center was completed and dedicated by Archbishop Daniel Cronin during the 50th Anniversary Year of the parish. In 2017, St. Therese Church celebrated its 70th anniversary.